Cockroach Pest Control in Toronto ON are resilient and persistent pests that are not only ugly by sight but they are vectors that can transmit a number of ailments. This is why it is imperative to seek cockroach termination services whenever you see the number of these insects increasing in your house or business premises. Failing to do cockroach pest control in good time can result into a number of consequences. The first one is the spread of diseases which is a serious health concern. Remember, cockroaches normally reside in very dirty places such as within the kitchen pipes, toilets etc. When they walk on surfaces like table tops or foodstuffs left carelessly in the kitchen, they leave all the dirt on such places which will in turn find their way into the person who eats those foods or handles the surfaces. Having cockroaches around is also a sign that something needs to be done about the hygiene standards of the house and it could be embarrassing for visitors to come visiting only to be met with an army of cockroaches in the room. But for us, our aim is not to judge you. We simply do away with the cockroaches. When called upon, our cockroach exterminator will clear the insects i n three simple steps. We first start by inspecting your home to locate all the places where the cockroaches are hiding. This will enable us to assess the magnitude of the infestation so that we devize a customized solution for exterminating them in the most professional manner. What then follows is the elimination of the insects through spraying with an appropriate liquid or power based solution. 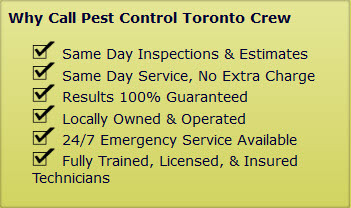 Feel free to get in touch with the Pest Control Toronto Crew if you're suffering from cockroach infestation. There is no point why you should continue suffering the embarrassment when we can offer you with the best cockroach pest control services available here in Toronto. We proudly service Ajax, Brampton, Burlington, Etobicoke, Maple, Markham, Milton, Mississauga, North York, Oakville, Oshawa, Pickering, Richmond Hill, Scarborough, Whitby, Woodbridge and Thornhill. Cockroach Pest Control in Toronto ON call (647) 557-7978.